Jupiter, the largest planet in the Solar System, has over 79 moons orbiting it. Its four largest moons are Io, Europa, Ganymede and Callisto. These moons are known as the Galilean moons. Here are ten facts about the first of these moons - Io - a volcanic moon that kind of resembles a pizza. 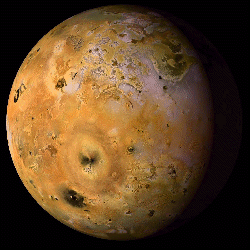 Io was officially discovered on 8th January 1610 by the Italian astronomer Galileo Galilei. He also discovered Jupiter's three other large moons, Europa, Ganymede and Callisto around the same time. These four moons are often referred to as the Galilean Moons in honour of their discoverer. Although Io's discovery date is recorded as 8th January 1610, it is likely that Galilei observed it on 7th January 1610 when he spotted three points of light orbiting Jupiter. One of those points was probably both Io and Europa, but Galilei was unable to distinguish them as two objects until the following day. Io is the closest Galilean Moon to Jupiter, although there are four smaller moons that orbit Jupiter at a closer distance. Io orbits Jupiter at a distance of about 421,700 kilometres (262,032 miles). Jupiter's closest moon is Metis which has an orbit of about 127,690 kilometres (79,343 miles). As a comparison, Earth's moon is about 384,399 kilometres (238,854 miles) away from Earth. Another astronomer who claimed to have discovered Io, and the three other large moons of Jupiter, was Simon Marius from Germany. His first observation was almost at the same time as Galilei's, but Galilei published his findings first. Even so, Marius suggested the names Io, Europa, Ganymede and Callisto, which is how we now know these moons. Io is named after one of Zeus' lovers, a naming convention used for many of Jupiter's moons (Zeus is the Greek equivalent of the Roman god Jupiter). In Greek mythology, Io was a Priestess of Hera. Although Marius suggested the name Io in 1614 when he published his observations of the moon, it was usually referred to as Jupiter I, meaning that it was Jupiter's first satellite. For a long time, nobody knew that Jupiter had more than the four moons that Galilei discovered. A fifth moon was found to orbit Jupiter in 1892 (Amalthea) with several more in the twentieth Century, which is when the moons began getting referred to under their current names. Io is the most volcanic object in the Solar System. There are thought to be up to 400 active volcanoes on the moon, which regularly spew out lava and create plumes up to 200 kilometres (120 miles) from that surface of Io, continuously changing its appearance. Io is sometimes referred to as the pizza moon due to the multiple colours of the contents of the lava deposited across its surface. Io's volcanic activity is caused by a gravitiational tug-of-war as the gravity of Jupiter pulls on Io from one side while Europa and Ganymede pull on the other side. This generates heat, a bit like the heat you get by bending metal one way and the other. Io's insides get extremely hot, resulting in volcanic eruptions through the moon's crust. The first time a volcanic eruption was noticed on Io, and indeed on any other object in the Solar System other than Earth, was in 1979 from images taken by the Voyager 1 mission. 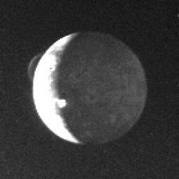 This was from an image taken of Io as Voyager 1 was leaving the moon, when astronomer Linda A Morabita spotted what looked like a round object coming from behind Io. Initially thinking it was it moon, she later realised it was a plume from a volcano. Io completes an orbit of Jupiter every 42.5 hours. It completes two orbits for every one orbit of Europa, and four orbits for every one orbit of Ganymede. The regular pattern contributes to the tidal pumping that causes the volcanoes. 42.5 hours is also quite speedy as it takes Earth's moon about 28 days to get around Earth.